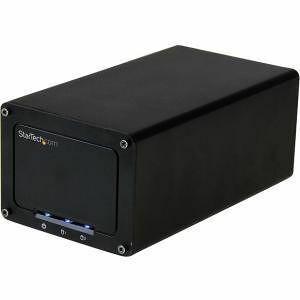 Create a high-capacity, external data storage solution with support for two 2.5" SSDs/HDDs in a wide range of sizes from 5 to 12.5mm. Tested for compatibility with capacities up to 4TB at 7200 RPM, this aluminum enclosure delivers fast file transfer rates with USB 3.1 Gen 2 performance. It supports SATA I, II and III and is enhanced with UASP to maximize the performance and speed of your SATA III drives. It even has a fan, with built-in speed control, to keep things running smoothly. USB 3.1 Gen 2 gives you greater bandwidth and speed, supporting transfer rates of up to 10Gbps - twice the speed of USB 3.0 (USB 3.1 Gen 1) technology. It lets you leverage the high performance of the latest SSDs and hard drives while alleviating bottlenecks in your data transfers. The dual-bay drive enclosure comes with two USB cables for flexible use with the latest laptops and tablets equipped with a USB-C™ port, as well as legacy devices. It includes both USB-C to Micro B and USB-A to Micro B cables. The 2-bay enclosure is also compatible with a Thunderbolt™ 3 USB-C port. Through RAID 0 support, the dual-bay enclosure lets you maximize the performance of your SATA III SSDs to achieve greater file transfer speeds. The dual-bay enclosure also supports RAID 1, Big (Spanning or Concatenation) and JBOD. With multiple RAID options, you can gain increased storage size, performance, or redundancy. The enclosure is OS independent, requiring no additional software or drivers. The S252BU313R is backed by a StarTech.com 2-year warranty and free lifetime technical support.